[Update 5/27/2016: You know what happens if you write someone… they respond; unless they are a General Authority or apologist at FAIRMormon and your point is valid. Here is Tyler Glenn’s response. I think it addresses all my concerns nicely, and although not written directly to me, it certainly answers the issues. I post it first as I think it makes my letter irrelevant. Well done, Tyler. In “The Scarlett Letter”, Hester Prynne is branded with a violent red “A” for all to see. At first, there’s no question: it symbolizes the sin of adultery, and Hester wears it as punishment. But from the very beginning, she’s not willing to let it dictate the terms of her punishment. I feel the most triumphant moment in my video for “Trash” is the moment when I “X” myself with red lipstick. I am not broken, or challenged. I will not live in fear. I will reclaim what is already inside of me. The scarlett letter that society places on those that challenge the status quo is violent. When i released the imagery for “Trash”, I knew exactly what would happen, and it did. But what’s ultimately empowering is “they” don’t get to brand me with that. I’ve already done it, and I wear that scarlett X proudly. Some have forgotten that my expression has context. It has a deeply personal journey attached to it. What’s inspiring is seeing so many of you use the X in your own way. I saw it at my show, I see them on your social media. It represents more than religious doubt. It represents more than anger and sadness and frustration and confusion. To me, the X represents a reclaiming of one’s self. The conversation that was started from my video has inspired me. Many of my “friends” aren’t friends anymore. Even family members have put up walls. I’ve seen the true nature of many through this experience, and It has been beautiful and tragic. What you must understand is ultimately, YOU have the power inside of you to reclaim what is already yours. That’s what this is about. It’s not about altered portraits and handshakes and religious folklore. I created this app because I saw and heard many of you wanting a way to express your own experience. The “X” can be yours if you need it. Be fearless. Be open to that further light and knowledge. Its a beautiful and inspiring journey to realize we know nothing at all for sure. But what we do know is that we are here now, and we have time to become our best selves. We can’t let the masses dictate our self worth and our experience here on this earth. Only you get to do that. First, this is not going to be popular to put out, and you’re probably not going to like what I have to say. I get that. I also get where the emotions came from that you used to fuel the video “Trash”. I mean, not exactly; but we’ve both gone down the road of leaving the same religion. I didn’t have the added LGBT aspect, but still, there is a lot in that video that spoke to me. Absolutely a brilliant lyric, so deep and impactful on so many levels. From the water used in the sacrament today vs. Joseph Smith’s wine; to the idea that no matter how much we drink of a false belief system it will never become true, to the comparison with Jesus’ miracles and the lack thereof in the modern church; just pure poetry. I loved that. Which why I think it’s sad so few members will hear it. The shocking nature of the video probably scored you more views and subscribes than anything you’ve done before. It certainly caused a stir outside the Mormon and Exmormon communities. This weekend Elder Holland went on a rant. I’m sure he feels his emotions are every bit as real as you feel yours are. But his nature and approach, using name-calling and ad hominum to insult those who believe differently than he does, I think besmirches the office he believes he is called to, and actually harms families. Your production is art, and as such, doesn’t carry the weight to destroy and harm the way an official message from an official representative from an organization does. I compare the two because both are driven by emotion, both are polarizing, and both are done for shock value. And in both cases, almost all of the rest of the message was lost while the shocking is focused on. It’s human nature. The MormonStories interview got your point across, I think a lot better, but had fewer views. The Shocking may have gotten views, but probably didn’t persuade anyone that the pain behind it was created by the organization. At least few current members. So if the goal was to capture the hurt and pain that exmormons would “Get”, then you achieved it. But as a dialogue piece, the shock and awe left a lot of the message unheard. I’d rather we had a dialogue of respect on all sides. 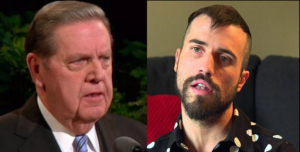 Ballard, and others like him, who show no respect to anyone with a different world view is not who we should emulate, but rather we should distance ourselves by being the calmer heads and warmer hearts. But as far as the emotion, I get it. And it is art. I hope it doesn’t set a precedent.